The proposed site in Kemnay. A group of north-east residents could take legal action to halt a controversial travellers site from being approved. 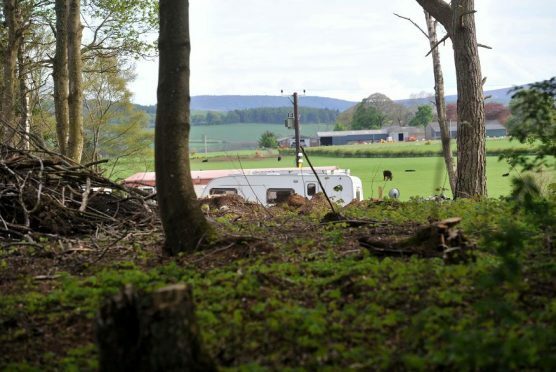 Plans have been lodged for a seven-pitch caravan park for travellers at Quarry Wood, near Kemnay. Yesterday, members of the Garioch area committee discussed the proposals, which have been recommended for approval – despite receiving 42 objections and five letters of support. The council has previously taken enforcement action at the site following complaints of tree felling and development work which did not comply with previous planning permission for three lodges there. But local resident Alistair McKinlay said the council had “turned a blind eye” to the site. He added: “I am very disappointed the council’s planning department is not supporting local residents. “The council failed to stop activity on the site. The local residents have suffered loss of amenity that was once there, the local wildlife that lived there is gone. He said residents would be willing to take legal action to “halt” the site if backed. The planned caravan park would include permanent stances for mobile homes and chalets, touring pitches, parking, a utility building and an access road. The developer will carry out compensatory tree planting at Butterywells, Potterton, to make up for the loss of trees at the site. West Garioch councillor, Sheena Lonchay, said the main issue raised locally was “about the disregard” of planning procedures at the Quarry Wood. She added: “I find Kemnay to be a liberal place willing to give people a chance. The planners have considered this application diligently. The wider planning question from this application is whether the (council’s) equality impact assessment takes precedence over a fairly adopted local development plan. However East Garioch councillor Martin Ford argued the “greater scale” of the application should be the main consideration. The committee’s comments will be passed on to a meeting of the full council, which will make a final decision.